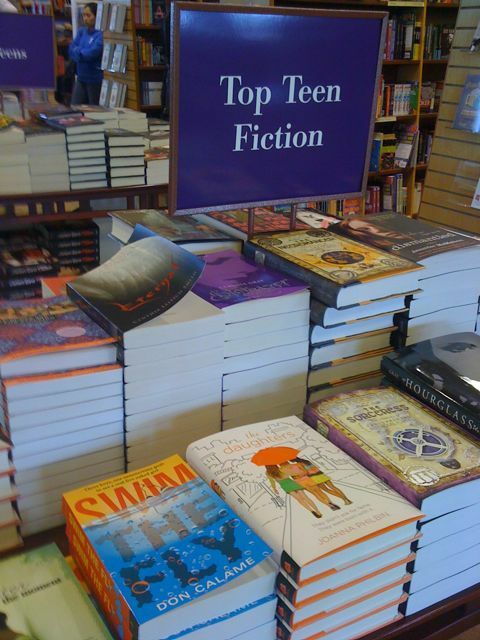 Top Teen Fiction at Chapters/Indigo! Just browsing through Chapters on West Broadway today, looking for some good hockey literature to ease the pain of the Canucks and Penguins early exit from the playoffs and look what I found!!! 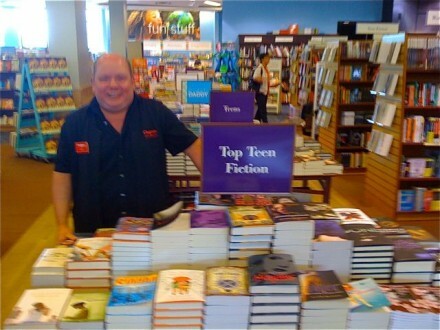 The fabulous Glen (who I must apologize to for my wobbly handed out-of-focus iPhone shot) at Chapters was kind enough to have me sign their stock of Swim the Fly and then he looked up on the computer to see that the book is not only Top Teen Fiction in his store but NATIONWIDE! So, apparently every Chapters/Indigo in Canada will have Swim the Fly on their Top Teen Fiction table. Which is super cool!!! Anyway, I just wanted to thank the great people at Chapters/Indigo for their support of Swim the Fly. It put a big smile on my face today to see the book displayed on that table and made me that much more excited about getting to work on the third book in the series. Some happy things and some not so happy things to report. First, let’s dispense with the negative. As far as I’m concerned the Stanley Cup Playoffs are done. Over. Finished. Oh, I’ll watch the Finals, sure. And I’ll pick a team to root for even if my heart won’t be in it. Maybe Chicago. Maybe San Jose. A team from the Western Conference (yes, Chicago is in the Western Conference for all you hockey neophytes and no it doesn’t make much sense) The Vancouver Canucks have been eliminated. The Pittsburgh Penguins have been eliminated. The New York Islanders eliminated themselves waaaaaaaay before the playoffs even started. I could go on a long hockey rant about the piss poor play of my favorite players on my favorite teams but that would just be sour grapes. Roberto Luongo has given me much to cheer about the last few years. Quadruple that for Sidney Crosby. Not so much anyone on the Islanders but what are you going to do? You can’t have everything all the time. Sometimes other people have to win. That’s the nature of sports. If your team won all of the time it would get pretty boring. So, I will leave it at that and move on to things more positive. Like the fact that the moving is OVER!!!!! We’ve moved. We’ve unpacked. We’re finished. Well, mostly. There are a few little bits to sort out still but the bullet train has slowed and we’re coasting into the station. I must say, I’m exhausted. But in a very satisfied way. The new writing room looks great. The house is beautiful. Life is good. And more good news. Look what just arrived at my doorstep. That’s right. 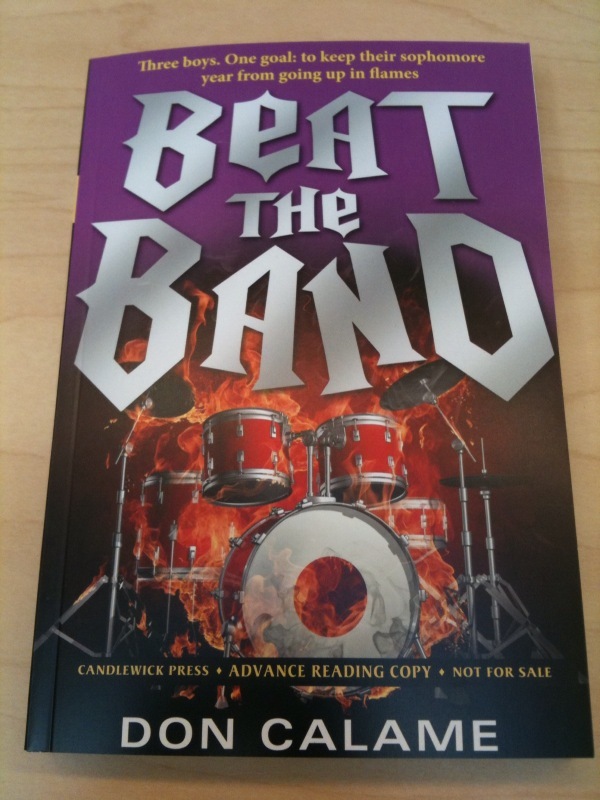 It’s the galley (or ARC, as they say in the Biz) of BEAT THE BAND. (photo credit to my editor, Kaylan Adair, as I was too lazy to take a shot of the one that’s sitting on my desk) How cool is that cover? I’m pretty pleased, I must say. It’s one of the best things about being an author. Getting that book in the mail. Seeing how it’s going to look on the page. Of course, getting the actual hardcover is even more fun but this is a very cool preamble. Now I’ll just cross my fingers that people enjoy it. Finally, I’m going to start actually committing new words to paper. Which means, hopefully, a third book to complete the trilogy. I’ve got a story in my head and hopefully my editor will like the treatment and sample chapters I’ve yet to write. We shall see, we shall see. But I’m getting antsy to start writing again and so I will end this blog and get to work.